<i>This is the bee that stopped on a tree in Enzo's splendid gardens. . . .</i><br /><br />And that's how this rollicking adventure from Patricia Polacco begins. A boy drops his book when he takes a good look at that very bee. Then a waiter, who'd just turned around, trips on the book and tips his tray--otherwise he'd have had a good day!<br /><br />Before you know it, the ladies have spilled their tea; chef Enzo has toppled the spaghetti, chasing his cat, whose name is Lettie. Dishes are hitting the floor; patrons are dashing out the door. 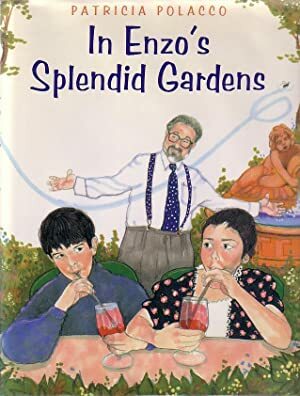 Oh, if it weren't for that mischievous bee, there in Enzo's splendid garden!<br /><br />In this amusing romp, author-artist Patricia Polacco introduces us to her husband, Enzo, who cooks the best spaghetti in Oakland, California (at least when he's not chasing the cat). A whimsical cumulative tale that is a treat to read aloud.<br /><br />Follow the trail of mishaps that happen--all because of a silly old bee!